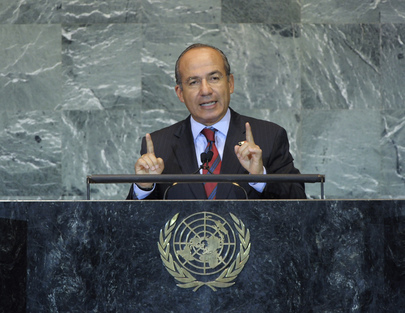 FELIPE CALDERÓN HINOJOSA, President of Mexico, said the extremely significant stories of major global changes — from terrorism to climate change, peace, poverty and economic crisis — had caught the Assembly’s attention. Against that backdrop, it was time to transform the United Nations, turning it once again into an Organization able to tackle the challenges of the current pressing times. Poverty was exacerbated by rising food costs, which had increased by 26 per cent over the last year, forcing the poorest families to allocate most of their income to feeding themselves. Consequently, many people around the world were going hungry, requiring that technology be harnessed to broaden access to food. More attention must also be paid to the causes and impact of drought. Financial speculation was also driving up the price of basic foodstuffs, such as wheat and maize, and the time had come to impose controls on those markets contributing to world hunger. Underlining the need to address the threat from transnational drug trafficking and organized crime, he said those phenomena were killing more people — particularly youth — than all the dictatorial regimes combined. Indeed, tens of thousands of people between Mexico and the Andes were dying at the hands of drug traffickers and unscrupulous organized criminals, who were sometimes stronger than the Governments fighting them. That strength was due to the exorbitant profits from their drug sales and their unlimited ability to purchase weapons. Pointing to the unbridled profits that resulted from the arms trade as the reason why those criminals had access to so many powerful weapons, he said serious controls were needed in countries producing and selling weapons. Organized crime was strengthened from profits generated by the sale of illegal drugs, he said, adding that continued consumer demand would increase criminal financing, and with that, its consequences. Now more than ever, consumer countries must take effective action to eradicate demand. Many said the continuing rise in drug consumption — particularly in the United States — made that impossible. But if the demand for drugs could not be cut, consumer countries were morally obliged to reduce the vast economic rewards from the drug market. Indeed, they must seek out all possible options to stanch profits, including through market solutions. Concerning climate change, he noted the impact of recent hurricanes in the Caribbean region and highlighted the agreements reached in 2010 on a binding instrument to limit rising temperatures to a global average of under 2° Celsius, as well as the advent of a global Green Climate Fund for adaptation and mitigation efforts. He also drew attention to a mechanism to allow countries to use their forests sustainably in return for payment for conserving their trees. Yet, Mexico feared that absent sufficient political leadership at the upcoming seventeenthUnited Nations Framework Convention on Climate Change in Durban, earlier gains in fighting climate change would be lost. Moreover, with the Kyoto Protocol expiring next year, further progress was needed, particularly regarding what would happen to its annex I obligations. To accomplish all that, the world community must break away from the false dilemma that societies had to choose between fostering economic development and stopping climate change. Among other issues, he noted the growing number of new hospitals being built in Mexico and boasted that the country would achieve universal health care this year, with medicines and treatment for every Mexican. Mexico also had already virtually reached all the Millennium Development Goals. The Mexican Government believed the United Nations bore the responsibility to constructively contribute to resolving conflict in the Middle East. Any solution must be politically viable and recognize the right to existence of Israel and lead to the establishment of a Palestinian State. Yet, no solution could be found while one side either explicitly or implicitly wanted to annihilate the other. Finally, just as the United Nations building was being remade, so, too, should the Organization’s structure be reformed. Mexico wanted complete reform of the Security Council to make it truly representative. “We cannot allow the greatest supra-national body to remain the decision-making body of the few,” he said.